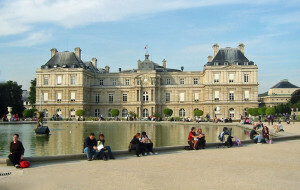 The Luxembourg Palace in Paris, the seat of the French Senate, is the epitome of decorum and elegance. But almost exactly 300 years ago, the palace was notorious for debauchery and excess by a member of the royal family. In 1615, Queen Marie de Médicis, the mother and regent of fourteen-year-old King Louis XIII, built a grand new palace for herself, designed to resemble the Pitti Palace in Florence in which she had been raised. The western wing of the Luxembourg Palace, named for a prior owner of the land, included lavishly decorated rooms for the Queen, complete with 24 commissioned paintings by Rubens. The identical eastern wing included rooms for young Louis whenever he visited from his home in the Louvre Palace. When Louis XIII died in 1643, he was succeeded by Louis XIV, who built his own palace at Versailles. When Louis XIV died in 1715, his famously promiscuous granddaughter, Marie Louise Élisabeth d’Orléans, took up residence in the Luxembourg Palace. Although a recent widow at age 20, she immediately began hosting drunken orgies, glutinous feasts and clandestine lovers. She concealed the resulting pregnancies in her increasing girth, earning the sobriquet “Princess Chubby.” When Voltaire suggested that one of the lovers was her father, Philippe II, Duke of Orléans and regent of King Louis XV, he was imprisoned in the Bastille, where he completed his play, Oedipus. Oblivious to the irony, Marie Louise, overweight and pregnant, attended the premier with her father, to the great amusement of Parisians. Hard living took its toll and she died, again pregnant at age 23, having already borne five children, none of whom survived. The orgies behind it, the Luxembourg Palace became a royal museum in 1750, displaying art eventually housed in the Louvre Museum. The palace was confiscated from the royal family during the French Revolution. After serving as the residence of Napoleon, it was enlarged in 1835 to accommodate the semi-circular chambers of the French Senate. Today, young lovers sit alongside the placid pond south of the palace, watching children sail their little boats. The bawdy days of Princess Chubby are long forgotten.